I just made my first quilt. I started dabbling in quilty-type projects last Christmas. So how on Earth do I have a stash of more than EIGHTY quilt fabrics?! Fabric under the bridge. The more important question is… what can I do with them now?! Last night I dug through the stash closet, and in among the historical wools and damasks and the heaps of knits for my mundane clothes, I pulled out every quilting cotton I could find and sorted them by color. Who knew I had so much light green? And so little purple? I have a couple of upcoming projects in mind, although nothing has settled yet, and now I’m wondering just how much you need to make a scrappy quilt?! A nice selection of lights/neutrals/creams! A fresh palette of light greens (NINE of them!). There are five yards of the lime polka dot—I have big plans for that one already! Cheery pinks! There’s not much of any of these (there is a FQ of the butterfly print), but I think they’re perfect for a scrappy project. The floral print came from a friend of my mom, and looks like old, well-worn sheets. The postal stripe and ISU print are remnants; there’s a large cut of the red damask, and a FQ of the red stripe. Clearly I need more orange. I’m surprised I actually don’t have more brown. I must have been restraining myself! Except that granite print at far right (Stonehenge Gradations Iron Oxide). I’ve bought that twice. Um. The dark greens and black-and-greens. Love these! Blacks! These are so dramatic. I have a lot of the white print next to the bats—that one will be easy to use. I also have half a jelly roll of mostly black Art Deco prints. Novelty prints. I didn’t try to take a picture of all of them—many of them are leftovers from Dad’s memory quilt, so they’re documented elsewhere. The Victorian ladies print is one of my favorite fabrics ever (scraps from a very, very early sewing project), just waiting to be fussy cut. Christmas prints! I separated out the ones that fit in other categories (the snowflakes, the hollies); these are the undeniably holiday novelty prints. I am currently waiting for a copy of Better Homes & Gardens Scrappy Happy Quilts to arrive at the library; there’s a lattice quilt in there I just might be able to make with some of this stash! …Or I may need to go shopping. From faux pinked microsuede to heaps of linen to damask tablecloths… here are some of the treasures that have lately crept into (and, erm, out of) my stash cabinet! Over on Pattern Review, we’re discussing our most precious fabrics—the ones we’re afraid to cut into, for whatever reason: Fear of the Wrong Pattern, Fear of Ruining the Fabric; Fear of Fit (now or later), General Unworthiness of Gorgeous Things. A lot of my uncut, been hangin’ around here way too long stash wasn’t even expensive; it’s just beautiful and I love it and it won’t tell me what it wants to be when it grows up. Grrrr. But this piece… this piece actually is Really Special. It’s a length of cotton batik for a sarong my father brought me back from Indonesia some time in the ’90s. I love it for what it is, this wonderful cultural snapshot shared with me by my dad, and not necessarily because it’s pretty. Some people might even think it’s pretty (Dad must have! ), but I’ve had trouble warming to the colorscheme and the mixed-up print. I like the geometric background. I even like the faintly Jacobean floral motifs. But together? Not so sure! 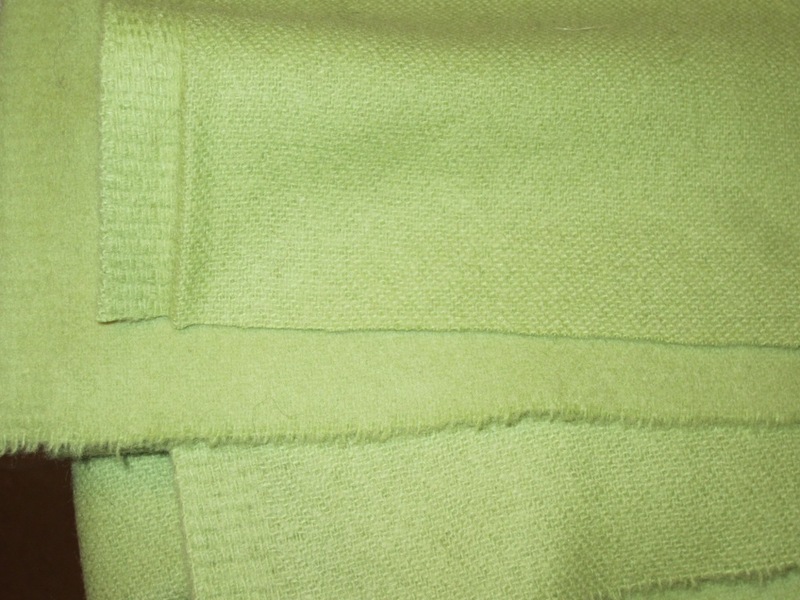 Full view, showing the cross-grain selvage. 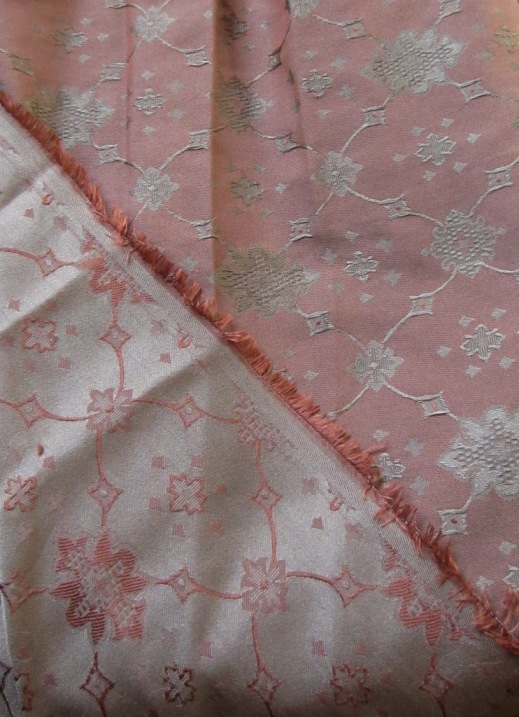 This is not yardage; it has four finished sides and must have been intended to be used as is, possibly as a sarong. According to Wikipedia, it’s the right length (just over 1 yard wide and around 2.5 yards long). I think this image renders the colors most accurately—a rich brownish gold and deep indigo/navy blue, all on a background of faintly off-white you can barely see. And you can see how BIG those darned flowers are!! This is truly one of the treasures in my stash, and I only actually started thinking of making something with it last summer. It would make fabulously comfortable summer clothes—but again, I don’t want to “waste” it. A pair of loose pants would be in style now, but what about in another couple years? It would be a great jacket… on someone else. Home dec would be the most permanent use for it, but then that’s denying its own intended destiny… plus it goes with nothing else I own. I could make it into something and give it back to my folks… but it’s MINE. My precious…. 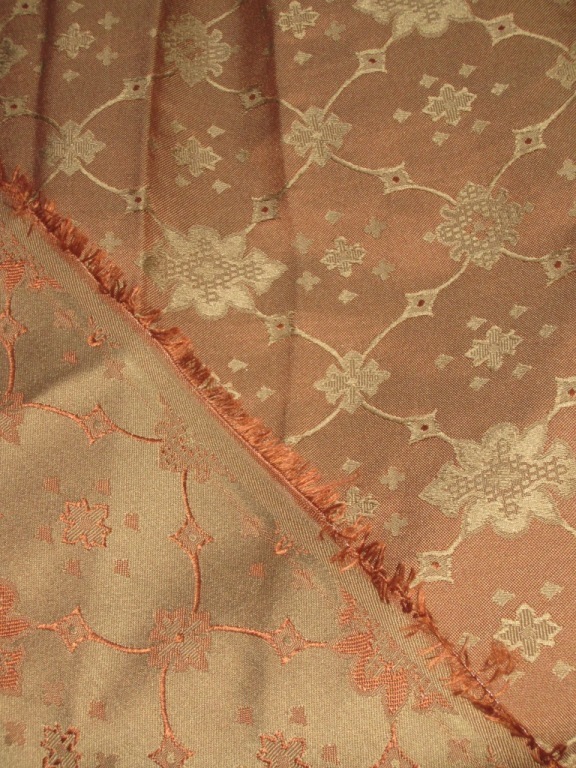 I have just nabbed 4.5 yards of splendid lightweight bronzey/copper damask, in a sort of “Turkish tiles” pattern. (The tag called the color “golden olive.” *shrug*) I’m hoping/assuming it has a substantial synthetic content, because I bought it specifically for it to get completely bespattered with muck on rainy/muddy days at Fair. But it does not yet know what it actually wishes to be, other than supremely washable.